In an interview with CURE, Badani, a professor of Urology at Mount Sinai Hospital, discusses the benefits of robotic surgery in RCC. Robotic surgery has been moving into the treatment realm for patients with renal cell carcinoma (RCC) who are undergoing a partial nephrectomy, and the procedure has shown to have many benefits. 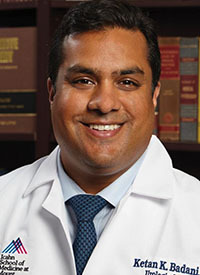 A patient can experience less pain, a quicker healing time and potentially more normal kidney function, due to the minimally invasive aspect of robotic surgery, according to Ketan K. Badani, M.D. In an interview with CURE, Badani, a professor of Urology at Mount Sinai Hospital, discusses the benefits of robotic surgery in RCC and use of the technique among urologists. Can you discuss where we currently are with robotic surgery in kidney cancer? Robotic surgery has permeated urology as a field quite heavily, prostatectomy being the most commonly performed robotic operation. However, the procedure that is gaining the most traction in terms of utilization has become robotic partial nephrectomy. The reason is because the robotic platform allows us to do partial nephrectomy more efficiently, since this is more of a challenge in laparoscopic operations. Additionally, we can do more complicated partial nephrectomies more often, which we were not able to do previously in the field. What are the benefits of using robotic surgery? In my opinion, there are two main benefits for using robotic surgery. The first is the ability to perform surgery that is minimally invasive. We know that whether it is laparoscopic or robotic, the patient will have less pain and a quicker healing time, which is appealing to patients. The other advantage of robotic surgery is in the nuances in the technical part of the operation. I am referring to how the length of time that the kidney is without blood flow when you do a partial nephrectomy can affect the function of it over time. What we’ve seen study after study is that time is shorter when you do this robotic surgery, which is protecting normal kidney function. The other part is being able to perform it to save the majority, if not all, of the normal kidney and taking out the tumor itself in its entirety. The balance between not leaving any tumor behind but saving as much kidney as possible, is a better operation with the robotic platform because of the technology, due to the integration of imaging and the surgical field at the same time. What are the next steps with robotic surgery? [There are] things that we should move forward on in terms of technological improvements. The first is that we can see well with integrated imaging. We can even do immunofluorescence to look at blood flow. The next logical step is the ability to tag cancer cells. This will allow us to see the cancer cells in real time so when we are removing the tumor, we know exactly where the cancer is, as well as where the normal kidney is, leaving no question or doubt. That would be the next hurdle to overcome. The foundation is in place, but we need to work out the biological markers. Additionally, there is a learning curve involved with robotic surgery, especially with complex kidney surgery. There are centers that do a lot of robotic surgery, and particularly complicated kidney operations, but in general, across the country, there is a learning curve involved with it. We need to figure out a way to transfer that type of experience to a much more general population of urologists who are taking care of these patients. How do you determine which patients will receive a robotic surgery? How you determine who gets robotic surgery is in the hands of the physician that is treating that patient. Doing an open partial nephrectomy, a laparoscopic partial nephrectomy, or a robotic partial nephrectomy are all good options. These are all good things to do. As you mature your experience with robotics, you start getting some of the advantages that come with it, but unless you’re comfortable doing that, you’re going to offer what you’re most comfortable with. Most kidney operations done in the United States are not done using robotics. However, most places that have active robotic centers are doing the majority of those operations with robotic surgery. In my program, I would say that 99 percent of patients would get a robotic operation. There are some medical contraindications, but not often. [However, robotic operations are] not what’s happening across the country yet. Are more doctors taking on this learning curve? The adoption of robotic surgery for kidney cancer has gone up quite a bit. This is where we’re seeing the most growth. There is no question that urologists, in general, are applying this technology to kidney surgery. Most urologists have experience with robotic prostatectomy and then you can transfer that robotic skill to the kidney. Just like in anything else, even open surgery, to do a complicated kidney operation, it is important to be comfortable doing that. There is an amount of experience, confidence and maturity needed to do a robotic surgery. If you’re just learning robotic kidney surgery, you should tackle the more straightforward tumors first and build up that learning curve before you start taking on the more challenging ones. Ultimately, you want to do it safely. The whole point is to be safe and robotic surgery is a safer operation. I believe that and we have data to support it, but it doesn’t happen on the first day.